Summertime has hit Central Texas hard, and my dog Oskar and I are trying to cope with the scorching heat. We’ve modified our running routine so neither of us passes out from heat exhaustion. We’ve trimmed our distances and focused on having fun instead of going fast. Oskar is a 2-year-old Australian cattle dog mix I got from the Town Lake Animal Shelter about a year and a half ago. 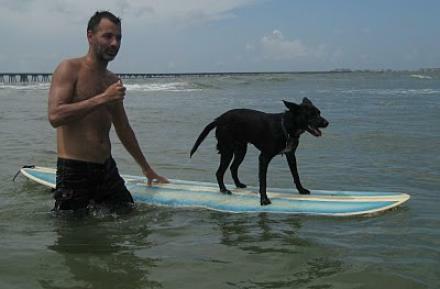 Lucky for me, he loves to run, swim, surf and catch Frisbees. Make sure your dog can go the distance. When I got Oskar he was ready to run and full of energy, but I started him out with an easy mile jog and slowly ramped up his distance. Even a mile may be too long for a dog that’s not in shape. You don’t want to overdue it. Can he handle the leash? Oskar still likes to pull on the leash from time to time, but otherwise he’s pretty dependable and comfortable with it. Still, if he eyes a squirrel, all bets are off. Try a basic obedience class or learn on your own (use a lot of treats). Breed of dog. Oskar is a short-haired cattle dog and was bred to work. If he doesn’t get enough playtime, he gets cranky. Some dogs don’t make good running companions. Make sure your dog can handle it. Bulldogs, for example, have a hard time breathing and some colder climate dogs aren’t built for the heat. Water water everywhere. 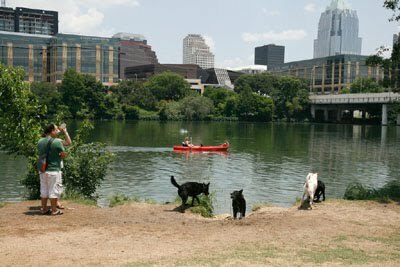 Here in Austin we are lucky to have Lady Bird Lake in the heart of downtown. Unless the water is flowing along the Barton Creek Greenbelt, I take Oskar downtown. He swims in the cold water coming off the Barton Springs spillway before we even start. I also let him jump in and cool off multiple times during our run. Plan your outing to include some swim time. You may be feeling the heat as you run, but your dog is doing it while wearing a fur coat. Drink up. Make sure your dog has plenty to drink before, during and after the run. Even if you don’t feel thirsty, your dog may need water. Go easy. Other than keeping your dog cool and wet, the pace you set is probably the most important part. Just as you have to slow down in the heat, so does your dog. Pay attention to his body language. If he his lagging behind and you have to pull him along, he may have had enough. Watch out for excessive panting and vomiting — they are indications that your dog is in trouble. Save the speed drills for when you are running sans the pooch. Have fun. It may sound cliche, but if you aren’t having fun, then why do it at all? If you do it right, your dog can be your best running partner. If you find, mid-run, that you just aren’t enjoying yourself, call it a day and try again another time. Be careful out there this summer. We’re stuck with this high heat through September, so take it easy when you run. And if you see me and Oskar, don’t tell him where the squirrels are hiding. Labels: Too Hot for Rover?